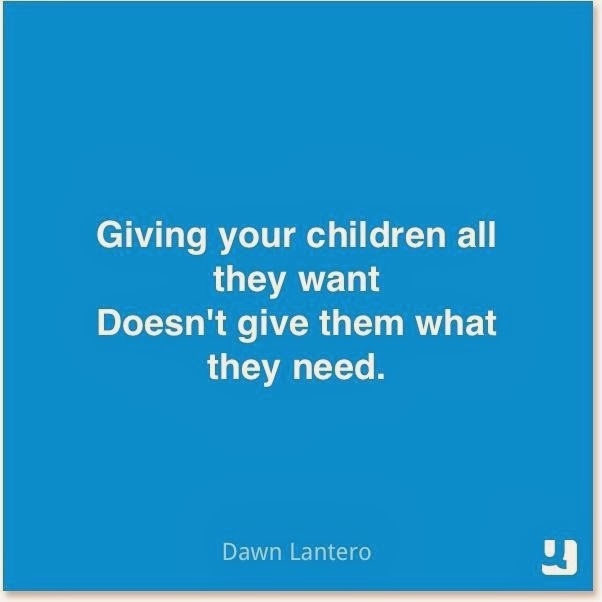 Probably the most common reason we Overgive to our kids. Why? Because parental guilt is present in epic proportions. We feel guilty that we are single parents. We feel guilty that we work. We feel guilty about everything! So we make ourselves feel better by giving everything to our kids. This method is not about what is truly best for the children. It is about us. When parents feel the need to show through material possessions that we love our kids more because we give them the latest and greatest of everything. This is competitive parenting. It's not keeping up with the Joneses anymore, it is surpassing the Joneses because it allows parents to feel superior to the Joneses and everyone else. Again, not best for the children, but fuels our desire to feel good about ourselves. This spoiling is rooted in the desire of the parent to be loved by the child and the misguided idea that if we give them everything or permit them to do everything and anything they want, our children will love us more and want us as their best friend. This needy type of parenting really shows it's ugly head as our children get older. These are the parents start out by buying the kegs for high school parties and often end up hitting the bars in later years with their only BFF's -their own kids. Your kids don't want you for a friend, they want you to be their parent! These three reasons seem to alone or in combination with one another motivate us to Overgive to our children and put ourselves at the bottom of the list. These types of parenting don't deliver the results we are looking for. Instead of resulting in children who worship us for our generosity and recognize the sacrifices we have made on their behalf, we end up having children who don't respect us or appreciate our efforts. So here is my plea. Stop handing everything to your kids and placing yourself at the bottom of the list. Take care of yourself. Realize that your kids won't respect you if you don't respect yourself. Remember your kids want you to act as a parent. They can make their own friends. They only have two or possibly one parent. Don't shirk your responsibility to be their parent-a loving authority in their lives. And develop a life for yourself that gives you and your children something to be proud of.